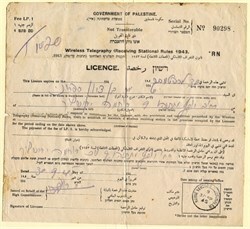 Government of Palestine Wireless Telegraphy License from the Government of Palestine issued in 1945. This item has the signatures of Palestine's high comissioner, and is over 65 years old. The license is written in English, Arabic and Hebrew.